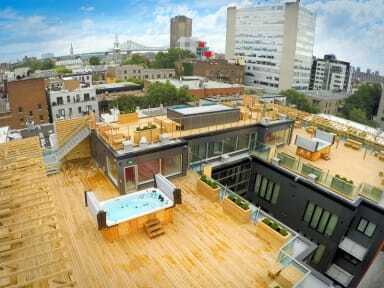 M Montreal is a very modern hostel set in a historical building in central Montreal, just a couple minutes' walk from Berr-UQAM station. All of their rooms feature ensuite bathrooms and big-screen TVs with cable. There's also personal lights and power outlets and plenty of space to hang up clothing. It's little wonder so many Hostelworld guests have told us that they'd stay here again and would recommend this hostel to friends! We went with kids and they had a great time. Staff is great and very helpful. I definitely recommend it. Really nice hostel, all facilities well planned! All was excellent. Would be nice if the hostel add nice warm meals in the bar! But it is close by to restaurants, so it is not a must. I thoroughly enjoyed my stay at M Montreal. The location was great- situated in the center of the gay village and only a 2 minute walk to the city's central metro station. The staff were all very kind and welcoming, giving me an abundance of advice on where to go. There is a Jacuzzi on the terrace and an nice bar in the basement. Great atmosphere- had reasonably priced drinks, free popcorn, and a pool table. Beds were hard, but the amenities were clean and I appreciated the extra bathrooms. The staff were super friendly and had great recommendations for bars/restaurants in the area, the staff were helpful in assisting our late, post-midnight check in after our bus ran late, and we were provided with a free place to store luggage on the day of check out which is quite uncommon in my previous hostel experience. The amenities in the room were top of the line as well, one of the best hostel/hotel experiences I have ever had!! Thanks to everyone at M Montreal. 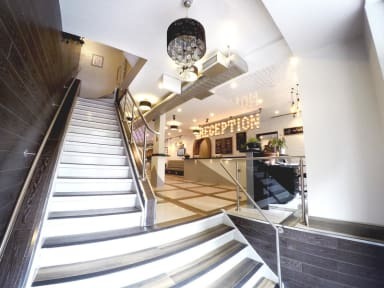 M is probably the nicest hostel I have ever stayed in I literally can't fault it in any way the beds were comfortable and very private even though we stayed in a 12-bed dorm. breakfast is great, the whole place is spotless, the staff are amazing. the basement bar is probably the best part just going down we were lucky enough to get to see the comedy show on Sunday which was hilarious. make sure you check out the rooftop deck for the swim spas . but i can't find a fault with m Montreal. This is one of the nicest hostels I've ever stayed in. Our room was so clean and quiet, the kitchen was enormous, the terrace was lovely, and the staff was so helpful with giving us advice on where to go! Would definitely recommend for any travelers in Montreal! Clean, Nice location, Kind staff Everything was good.